“Bitcoin” and “responsible investing” are two terms that are almost never used together. In this post we are going to do what may appear impossible on first glance: show you how to buy bitcoin in a way that you benefit from its price appreciation, but can’t lose money. Let’s say you have $10,000 that you want to grow for a period of five years. The first step is to use some of that money to buy a bond, such that you get back $10,000 after five years. The current interest rate for a five-year US government bond is 2.6%, meaning that putting $8,800 into a US government bond now would become, in the span of five years, $10,000. That leaves $1,200 of the original $10,000 left-over that you can invest in other things. Notice that even if you lose that $1,200 completely, you’ll still end up with $10,000 at the end of five years. That’s how you can ensure you don’t lose your original investment. We want to put the $1,200 that isn’t invested in bonds into something that will appreciate with bitcoin. The simplest way to do that is to just buy some bitcoin. You can do this on Coinbase or one of the numerous other bitcoin exchanges. Let’s look at what payoffs will be in different scenarios. That’s it. We’ve constructed a portfolio that cannot lose money and receives some participation in Bitcoin’s upside at the same time. Buy call options on bitcoins: As of March 2018, there isn’t an easy way to do this as a US-based investor. LedgerX does have a market for options on Bitcoin, but the platform isn’t open to retail investors. Buy bitcoins on margin: There are platforms offering margin accounts that allow you to trade up to 100x leverage (!!!). In our example above, you could take the $1,200 that you put into bitcoins and use it to buy $2,400 in bitcoins on margin. This would mean that you are 2 to 1 levered and your gains and losses would be magnified by a factor of 2. 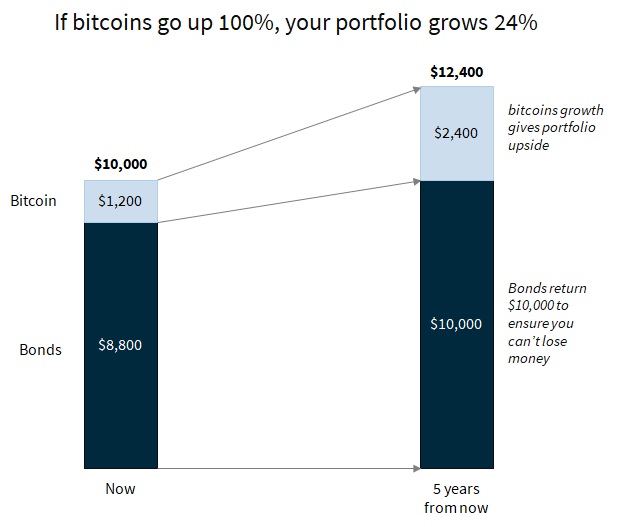 The problem with this approach is that if bitcoins ever drop 50% from the current price at any point in the next 5 years, your account will be liquidated and the overall portfolio will only return the original investment. This will be true even if bitcoins eventually end up a lot higher than it is currently, 5 years from now. 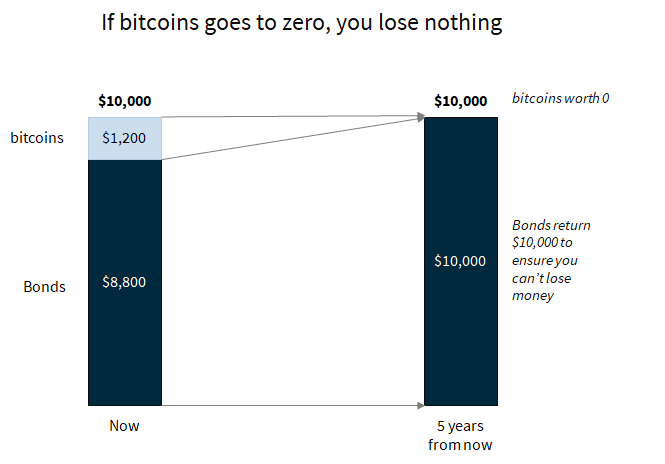 Be willing to accept some loss: If you are willing to lose up to 10% of your portfolio, you could buy enough bonds so that you are guaranteed to get back only 90% of your original savings instead of the full 100%. This allows you to have more money to put into bitcoins, allowing you to participate more on the upside. 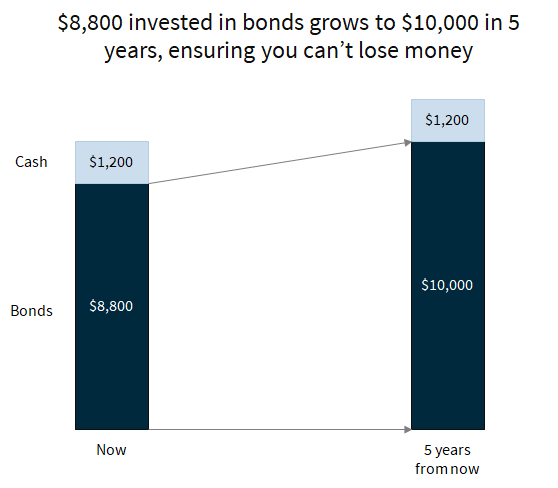 Increase your investment period: If you are willing to hold this portfolio for longer than 5 years (e.g 10 years), you’ll need to invest even less money in bonds so as to ensure you don’t lose your original investment. This allows you to buy more bitcoins and participate more in the upside. Investing in bitcoin has been a hair raising experience for many. There have been reports, for instance, of people taking out mortgages to buy bitcoin. We think that is highly reckless investing. In this post, we’ve tried to give you a framework to think about how to limit your losses, while being able to participate in the potential upside in bitcoin.